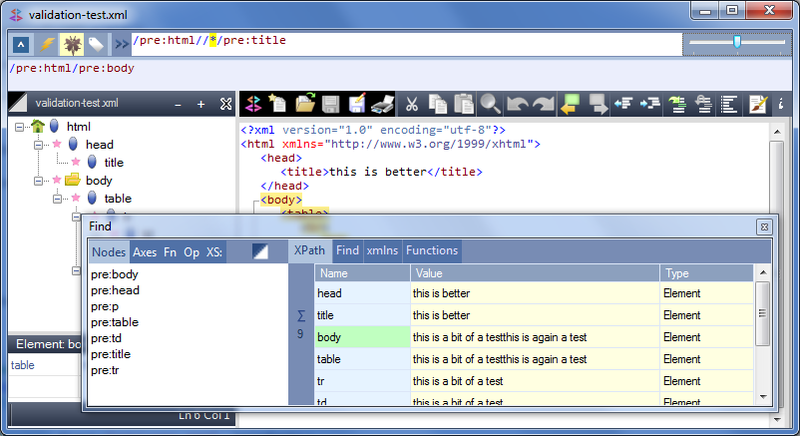 XMLQuire's XPath Editor has auto-complete, tracing, syntax-coloring, dynamic-evaluation features at its core. Blended with a fully-featured XML Editor, a compelling new XPath test and development environment is now offered, building on our orginal SketchPath tool legacy. The XPath-Location bar, at the very top of the XMLQuire window, is the only visible part of the editor when XMLQuire opens. Double-Click on this for the full XPath Editor view. Alternatively, select the XPath tab on the Find dialog. XMLQuire itself no longer supports XPath 2.0 due to redistribution costs. Instead, I've launched a separate web-based XPath 2.0 editor, Pathenq. If you're fortunate to be able to use XPath 2.0 in your solutions, then this is the way to go - so please try out this new tool. It's already fully functional, but this is at an early stage (as of Oct 2012) so new features added at a steady rate. Copyright © 2012 Qutoric Limited. All Rights Reserved.